The coldest weather in decades brought its share of challenges this week, but those who needed to travel still found buses and trains operating largely on time. The biggest impacts were felt along the Blue Line, where crews responded to cracks in the track overnight on Wednesday and Thursday. Light rail vehicles used a single track so service could continue as repairs were made. At the Franklin Avenue and Big Lake operations and maintenance facilities, heaters that normally keep switches functioning in the cold were no match for the sub-zero temperatures. Instead, staff had to manually move the switches so trains could come in and out of service. Some temporary speed restrictions were also put into place were also put in place on the light rail and commuter rail lines. “It really has been amazing that we’ve been able to keep the railroad open,” Light Rail Director Mark Benedict said. For bus operations, one of the biggest challenges was simply keeping buses warm. Operators were asked not to open the rear doors to help keep warm air inside. When operators called to report stalled vehicles, managers went to their homes and brought them into work. 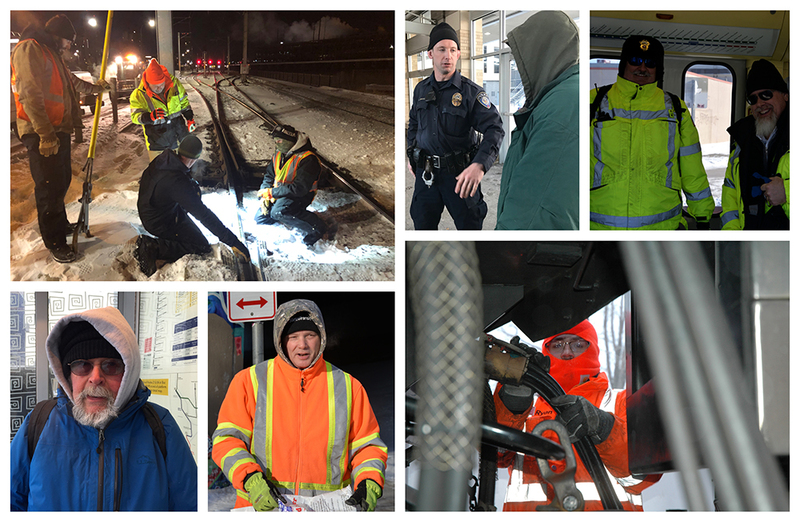 Customers who braved the cold appreciated not just the service, but the attentiveness of operators and other staff. Julie Givens, of St. Paul, said her family worried about her traveling on Wednesday. But after 40 years of riding transit, she assured them she'd be just fine. The bitter cold followed the first appreciable snow of the winter, which arrived overnight Sunday. While call volume doubled, it almost looked like a normal day in the Transit Control Center (TCC). Two buses got stuck, and there was one minor collision.